Don’t Sell Your Old Smartphone. Give It A New Life. – Food. Beer. Stuff. The wife and I are notoriously cheap. This is not a bad thing as we choose to simply spend our money on the things that really matter to us. It was for this reason that we have had the same cell phones for the last five years. With our battery life dwindling and a host of other issues over the last few months we finally had to relent and go shop for new phones. So with the new phones a new problem emerged. What to do with the old phones? The first thing that crossed our minds as I am sure is the case with most is “Can we sell them?”. The fact of the matter were the phones were free in the first place as I had found a good deal on two refurbished phones so any amount of money would have been a net positive. A quick look on some of the better known phone buying sites gave us an offer of $20 for each. Not bad for a free five year old phone but when I thought of what I would be giving up, essentially a tiny wifi computer valued at around $550 or so when new, the offer just didn’t do anything for me. Now if I were to only throw the phone into a drawer and forget about it maybe it would be best just to take the $20 and call it a day but I was determined to find a good use for these phones. Well, I am happy to report that I have found a good use. With just a quick free app download and a bit of messing about with my router I was able to turn my two Motorola Atrix cell phones into always on IP cameras that I can access anywhere in the world as long as I can connect to the internet. Before I get into the “How To” section of this article, I’d like to talk about some of the reasons why this is such a good thing for us. For one, my wife is in love with our three cats. Pictured from left to right Boomhauer and Pickles. Super Pretty Kitty could not be photographed as she was hiding under the bed. This is nothing unusual I am sure but my wife is REEEAAALLLYY in love with them. To the point that we have canceled trips in the middle of the night because she was certain the house was on fire and the cats were being burned alive. Lucky for her, we always seem to come home just in time to avert these disasters. 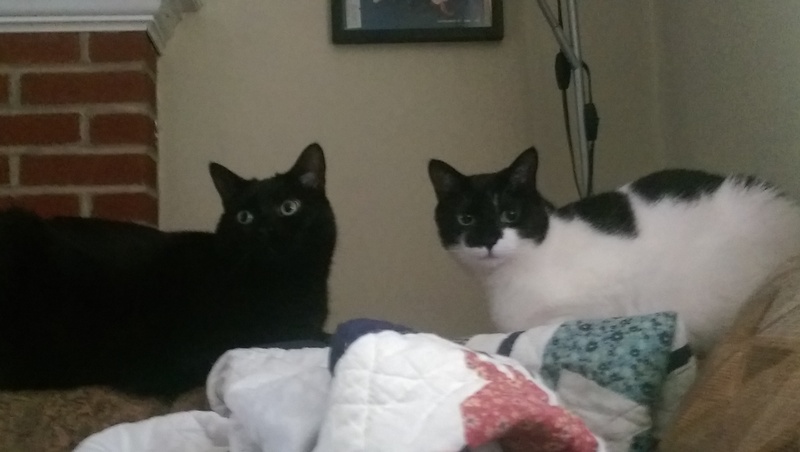 In the months leading up to our honeymoon, it was nearly impossible to convince her to go as we were having huge problems finding anyone willing to take our three cats for the week, as well it should be. The fact is that cats can be left alone as long as someone comes by each day to feed them and give them a little contact. Heck, I spend all day at home and I hardly see them unless it is time for a feeding, they are simply independent creatures and don’t require all that much care. So it was with a heavy heart that she relented and reluctantly went along with the plan to have someone come by each day to feed them, clean up and play with them a little bit. Don’t go thinking she was fine with it though, the entirety of the trip she was worried about them and requested daily assurance that they were all still living. So to move back into talking about a reuse of our old cell phones, with the “cat problems” (or really, wife problems…) I was having, I had for quite a while been thinking about setting up some sort of home surveillance system so that when we travel she could check in on her own and see that everything was OK for herself. Pricing it all out it seemed like a bit much of an expenditure. Decent IP cameras will run you about $100 or so each and I had not yet justified such a cost for our limited use of the devices. It was while I was thinking of this that I suddenly had the realization, “Hey, our old cell phones have cameras on them”. A quick search verified that I was not the only one to have come up with this idea and even luckier, many had already successfully done so. Great! The center of this system is a free app in the Google Play store called IP Webcam. If you wish to simply have the cameras displayed over your home network (allowing access only when you have access to the same internet connection as the cameras) then this is all you will need. You download the app, install it, run it and it will give you an IP address that you can type into any browser on the same network and watch the stream from the camera. This is great if you only wish to setup the cameras to be used while you are at home for reasons such as a baby monitor or to keep an eye on the front yard while the kids play but for my needs this wasn’t going to cut it. To be useful to me, I needed these cameras to be accessed anywhere that I was (or rather my wife). To do this requires a simple process called “port forwarding” this process varies depending on what type of router one has but if you were to search the internet for “my router model, port forwarding” you should be able to find a slew of how to’s for your particular router. Essentially all you are doing is instructing your router to allow outside access to the particular ports used by the cameras, by default the router will not allow outside access to ports so you have to instruct it to do otherwise. With the ports forwarded I now had a new problem. I needed to find an easy way to have my tech challenged wife be able to access the streams. After all the cameras would have no use if she couldn’t access them. After trying out a few solutions I found a free app that did exactly that. 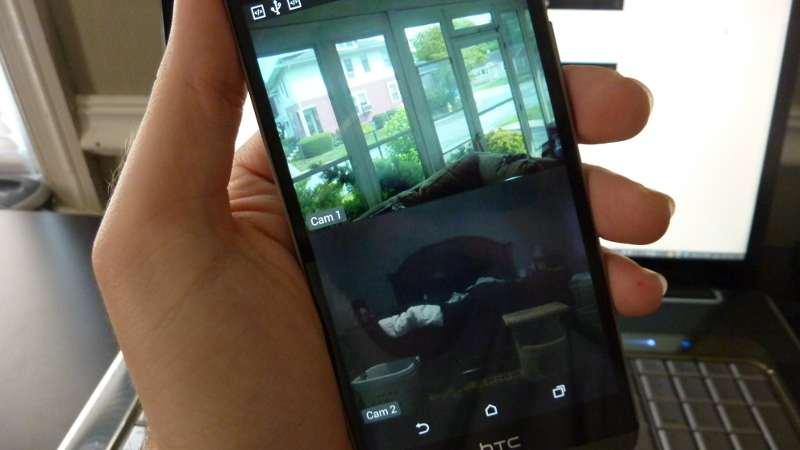 TinyCam Monitor FREE, is well, the free version of TinyCam Monitor Pro. The free version, rather than being ad supported simply limits some features such as audio streaming, use as an intercom and various other features that may or may not be worth the $3.99 price tag to you. For me, the free version did everything I needed which honestly was just a one button solution for my wife to view the cameras. Another problem was that our cats spend 90% of their lives in our bedroom sleeping on the bed. If I was going to have a internet connected device streaming live footage I needed to have some way to limit the access to it. Luckily, IP Webcam allows for one to create a Username/Password that is necessary to enter to be able to view the streams. Once setup I just had to go back into TinyCam Monitor and update the camera settings with the new Username/Password so that it would not have to be entered every time we wanted to take a look. The Kitty cam, mounted on a modified toilet paper roll core as it sits in our bureau area meant for TV equipment, next to our Roku (more on that later). For the other camera, I decided it would be best put to use keeping an eye on the front door. Not that I have all that much fear of intruders but it is nice to see who is knocking without having to get up and say hi. The majority of unannounced visitors to my home are simply selling something and I have a hard fast rule that if someone is selling something door to door I have no interest in buying it. They could be giving away gold bars and I would tell them to take a hike, I just hate the sales tactic and will not support it by actually rewarding the behavior. Not to mention, if it was so great they wouldn’t have to walk around knocking on doors to tell me about it. The other camera keeping watch on the front door area. Also mounted on a toilet paper roll core and taped in place so the cats don’t move it. Unwelcome interruptions aside, it is also nice to be able to take a look outside when my dog hears something and I have also found great benefit when I am having food delivered. Previously I would feel compelled to check out the window every couple of minutes as waiting for them to knock would start a barking marathon that wouldn’t end for hours. Every slight noise after someone knocks gets my dog worked up and it takes him forever to calm back down. Now I just pull up the camera on the other computer or my new phone (if anyone is interested I went for the new HTC One M8) and can keep an eye on the situation and meet the delivery person outside long before my dog is ever the wiser. This alone makes it all totally worth the price (oh yea, it was all free). This brings me to my gripes. My system is far from perfect, if I had to pay any significant amount of money I would actually be quite upset with my setup. The most glaring deficiency is night vision. Once the sun goes down, so does the usefulness of my cameras. Though I can turn on the flash light remotely, as well as increase the exposure these do little to actually help in my case. Both cameras are mounted behind a plate of glass so the light simply shows a reflection of the area behind the camera. Turning off the lights in the room helps quite a bit but is not always practical if I am making use of that room. These cameras also must always be plugged into an outlet, though perhaps possible to hardwire into the houses power, for me this is not feasible so camera mounting locations are quite limited. I was lucky enough to have two longer usb cables taken from my kindles which helped me quite a bit but if I was using the cable supplied with the phone I would have to buy extension cords which would make this system less appealing (the only real plus being this cost me nothing). 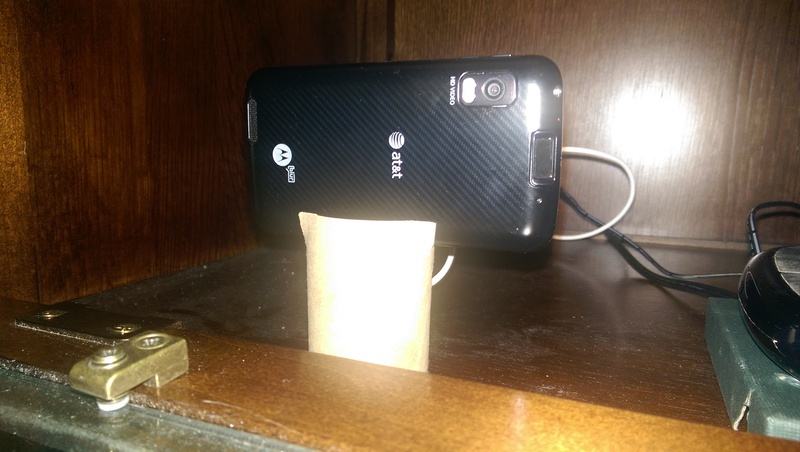 Also, speaking of mounting, smartphones are obviously not meant to be mounted onto a wall which took a bit of trial an error and a few toilet paper roll cores. Finally, and perhaps my biggest gripe of all is I cannot pan the camera to look in other locations. One has to point the camera where they can get the best view of what they think they will want to see. When the action occurs, I have to hope that my cameras are pointed where I want to look or physically position them where I want to see, thus ruining the point of having the camera there in the first place. Another problem, though minor is I have not yet figured out how to record anything. This is no big deal for me as I only want the cams for observation but it could be a deal breaker for many. I am sure it is possible I just haven’t been able to figure it out yet so keep that in mind. That all being said, I am quite happy with the system as it is. It does the minimum of what I wanted, it didn’t cost me a penny and I had it all setup and running in just a couple of hours. Not to mention, I get to keep the usefulness of an antiquated product which to me is much better than the $20 I would of gotten from selling it online. If I ever do decide to purchase a more suited camera, I can add it right into my system and not miss a beat. So I am satisfied. 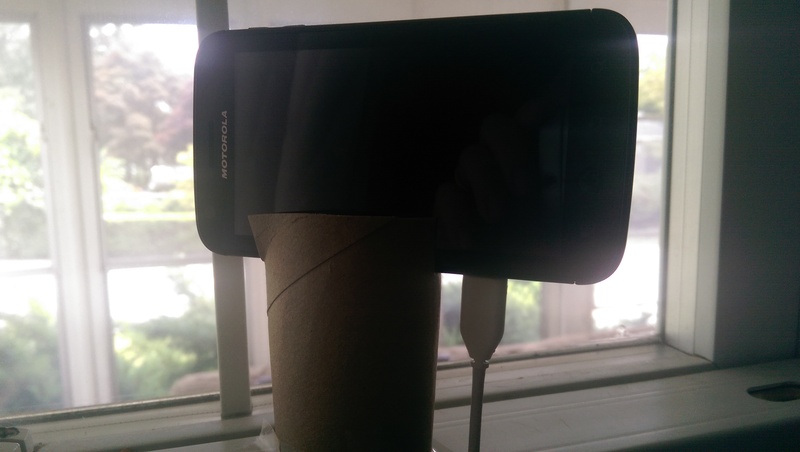 What other uses for old smartphones can you come up with? Have you setup a similar system? 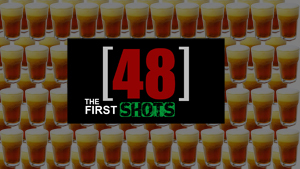 Let me know in the comments as I am always looking for new and better ideas.